Online when out and about, without cable and without worries.Find your hotspot! E-mailing, surfing, blogging, chatting, logging in onto your company network… Telenet Hotspot guarantees superfast wireless internet access in numerous public places like airports, train stations, petrol stations, schools, cafes, squares, shops, ... You just continue working on your own laptop, smartphone or tablet. Where and when you want. Telenet Hotspot gives you a reliable and safe service. 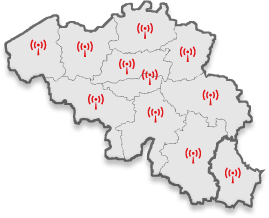 Find your location among the 1.500 Telenet Hotspots in Belgium/Luxembourg. Distinguish yourself from your competitors: with a Telenet Hotspot you offer your visitors, customers, patients and business partners a service that is strongly appreciated. Your own staff can also work via the Telenet Hotspot: this increases your company’s productivity and the mobility of all employees.